I played a PEI singer, Rose Cousins a couple of weeks ago. Here's another Islander, also an old friend, Lennie Gallant, with a fun video, home-made film style. Mary MacADNski: It is nice how some patterns come out from different viewpoints. Mary MacADNski: Settled by Scots you know. Mary MacADNski: Soon the greens will be astonishing. I like the tartan effect. Mary MacADNski: It was settled by Scots of course. I love the patterns! What a great video and song! How fun to be able to say you know him! Mary MacADNski: I've known Lennie since the late 70's. He still plays here lots though he no longer lives here. Mary MacADNski: If it would warm up, it could happen overnight. It has been s slow, cold spring so far. Mary MacADNski: I love his music. Look him up on youtube. I like the photograph Mary, the field pattern looks like a tartan design. Mary MacADNski: The area was settled by Scots. Show how imp[ortant those tartans are, eh? Mary MacADNski: From a different viewpoint it would be totally different. The pattern on the fields is like a Scottish tartan. I do like that view of the mountains in the far distance. Mary MacADNski: The area was settled by Scots. Their tartans are important, eh? Mary MacADNski: No, this is last year's leftovers. Beyond that undulating terrain I would have expected to see the desert, but no, trees and ... lake, river, sea? 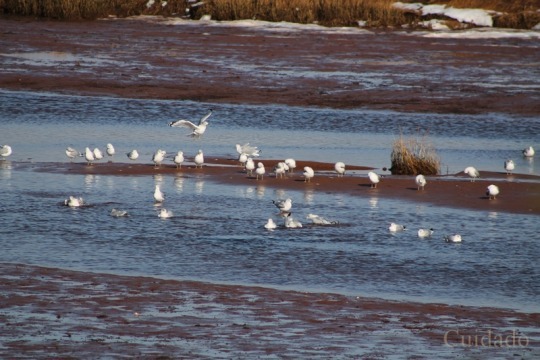 Mary MacADNski: The Northumberland Strait, between Prince Edward Island and Nova Scotia. I like the patterns across the field; it looks like woven fabric.